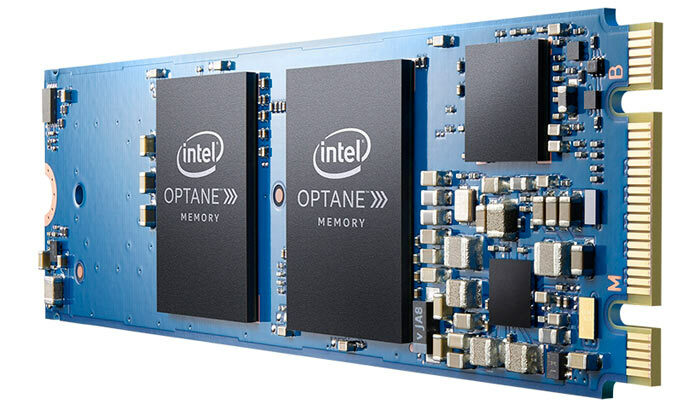 A week ago Intel started to ship the first Optane PCIe SSDs to businesses and enterprises, the Intel Optane SSD DC P4800X 375GB. Now the corporation has followed up by releasing Optane cache drives for consumers. We previously learned about these low capacity cache drives back in January when they were shown off at CES 2017. A little later it was announced that they had started to ship to hardware partners for testing. With their low capacities, Intel is angling these modules as devices to boost HDD-based PC responsiveness, though they could still offer some acceleration to users of SATA SSDs as their primary storage. So all the figures you see quoted on the Intel Optane consumer promotional pages are for HDD storage based systems being perked up by Optane. See the footnotes on the Optane memory product page, for example. Intel rationalises its HDD-boost promotional angle by quoting the statistic that "79 per cent of desktop PCs still use hard disk drives as the primary storage". To use one of the new Optane cache drives you will have to have system support in place and at this time that means a 7th generation Intel Core processor and 200 series chipset. On that topic we've just had an email from Asus saying that it has a new UEFI BIOS for M.2 Optane support in its 200-Series motherboards. Asus, like Intel, suggests that an Optane drive is a great companion for a roomy HDD. So, it's like cache SSD, on a quicker interface, that we've had for years? Woop. The 79% figure is more a damning indictment of manufacturers continuing to fit HDDs well beyond their lifetime - how many of them are in domain joined PCs in businesses where everything on the disk fits into 40GB, yet they have 500GB HDDs from the factory? Price wise this does look intresting but I would love to see real world testing and results before even contenplating buying one. 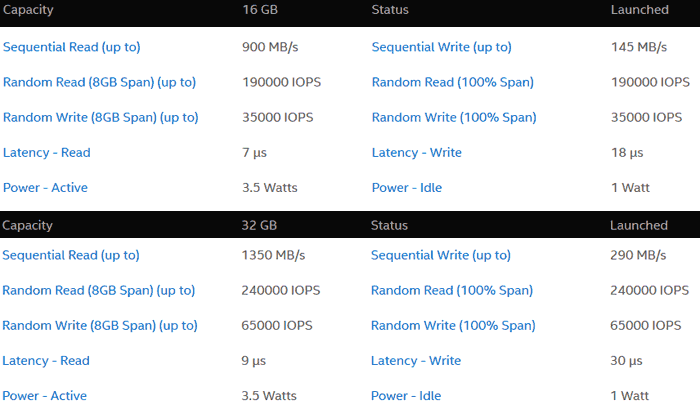 The seq writes are pretty poor on these How are these x10 or x14 more faster than M.2 NvME, i dont think they are. The IOPs are only the best thing about them, Which are more a factor with large databases etc rather than normal work for average consumers. M.2 is a form factor. It can transport PCIe, SATA and USB signals. I would expect these to use PCIe, though. Any clarification on the matter would be welcome, however. Because only two PCIe lanes are used by the drive, it is keyed to support M.2 type B and M slots. This keying is usually used for M.2 SATA SSDs while M.2 PCIe SSDs typically use only the M key position to support four PCIe lanes. The Optane Memory SSD will not function in a M.2 slot that provides only SATA connectivity. Seems to me there could be quite some compatibility issues if you're unlucky.